One of the things I had been wishing for for the LONGEST time was a way to preview Photoshop brushes outside of the Adobe Photoshop application. I had uninstalled most of mine because the GUI would run off screen due to the number I use when I tried to use them in Photoshop. Plus, I wanted to be able to better organize and categorize them when searching for one to install/load while using Photoshop without having to use the laborious “search and discover” method. Every 6 or 8 months, I’ll get a proverbial wild hair up my derriÃ¨re and spend a few weeks searching religiously, but give up after bookmarking a few dozen links to peruse, only to find nothing. 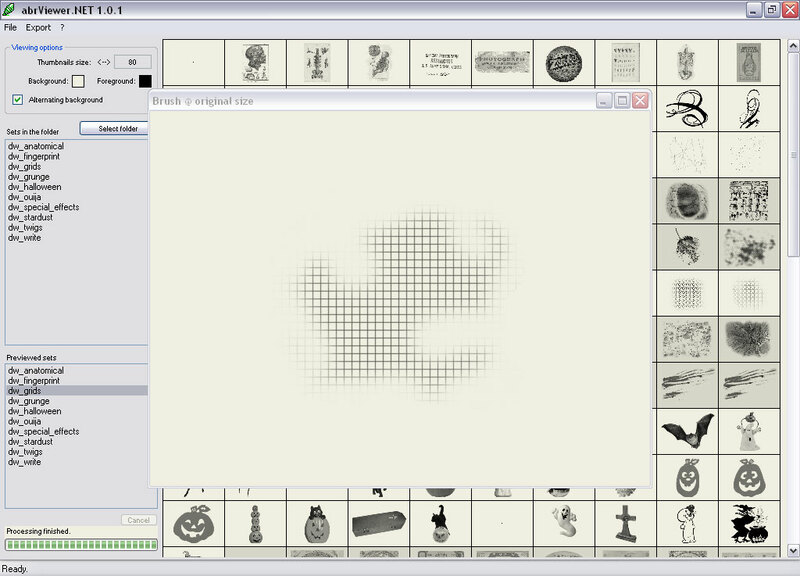 Well, on a hunch, I decided to go back through my archived bookmarks from a search I did over a year ago and ran across something on Justin Palmer’s site — he had posted that he was working on a .NET app called Brushpod, which would allow you to preview brushes. He had unfortunately decided to discontinue the project. 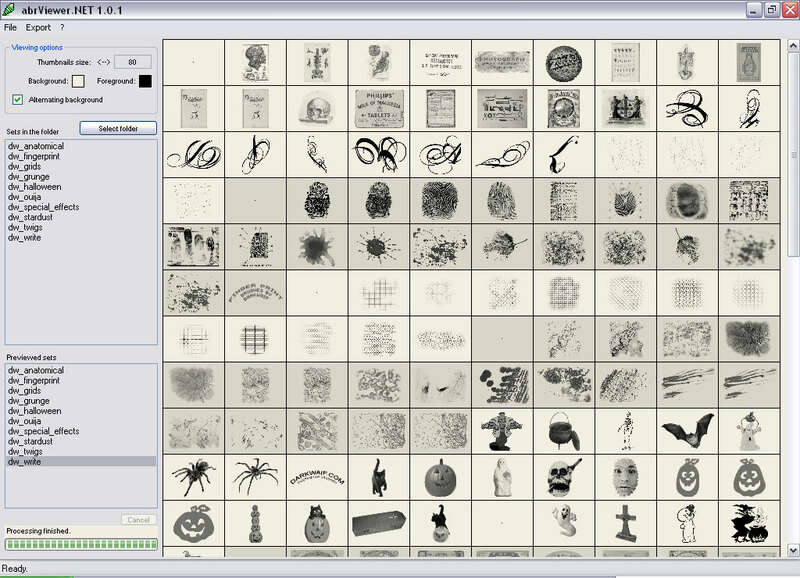 However, someone posted a few months ago that there was a similar app available on SourceForge called ABRViewer. I downloaded it today and must say that I am so far very impressed! I made a few screenshots in the hopes that it might be useful to some of you. As an example, I am using some brushes I downloaded from DarkWaif’s site. – This is the main GUI after I’ve loaded all brushes in a folder. You can load them one by one if you want. To unload one, you just right-click in the Previewed Sets window. I like how the author has each brush preview loading in alternative backgrounds so I can tell where one brush ends and the next begins. 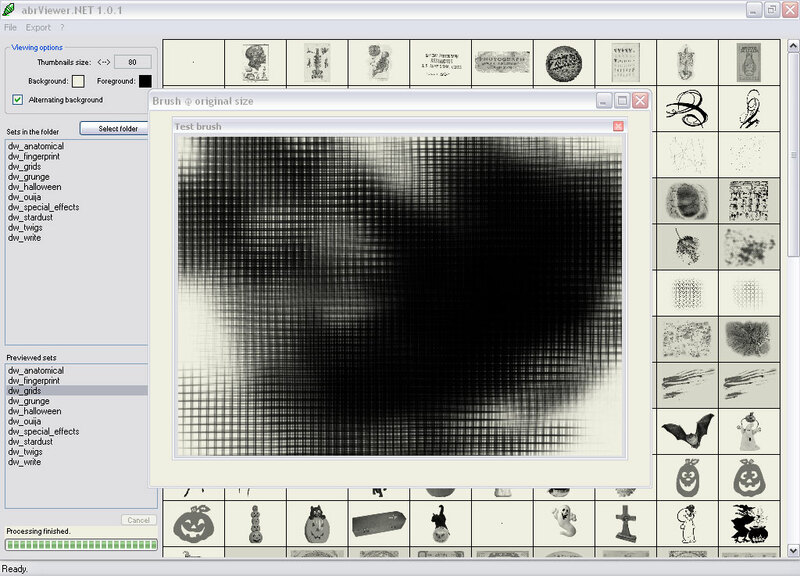 You are also given the options of exporting thumbnails for a folder of brushes, or the preview panel for the brushes you currently have open. I’m hoping the author adds subfolder processing to the next release, as well as an option to set a default location or folder to open — those would be the only things that I’d change about this app. how cool is that. /me downloads it.